Saturday nights have been alright for the University of Hawai’i basketball team. The Warriors improved to 4-0 at the Stan Sheriff Center during Saturday night games this season after a 69-60 victory over Cal Poly last Saturday. In what is becoming another Saturday night tradition, the Warriors stayed on the arena concourse after the game to sign autographs and pose for photographs with hundreds of fans. 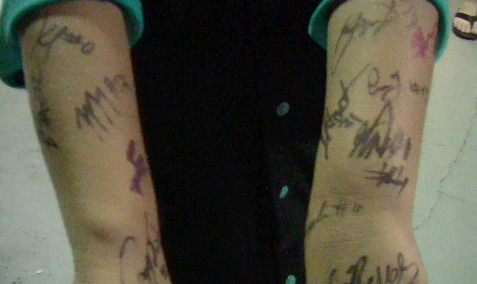 One fan, 12-year-old Elijah Wells, got every player to sign autographs on his arms … and then he vowed not to wash it off. Saturday night was also “Superhero Night” and several of the costumed characters stayed after the game as well to pose for photos with the fans. After going 2-2 on a four-game homestand, the Warriors will head back on the road this week. They are scheduled to depart Honolulu on Tuesday afternoon for Los Angeles. Hawai’i, which is 16-7 overall and in fourth place in the Big West Conference at 5-4, will play at UC Riverside on Thursday, then at Cal State Fullerton on Saturday. Riverside is 8-15 overall and tied for seventh in the conference at 3-6. The Warriors beat the Highlanders, 100-69, last month in the Sheriff Center. Fullerton is 7-15 overall and in ninth (last) place at 2-6. The Titans are the only Big West team the Warriors have yet to face so far this season (they will play again in the season finale on March 8 at the Sheriff Center). Despite another impressive statistical week, Hawai’i forward Isaac Fotu once again was not the recipient of the Big West Conference Player of the Week award. UC Irvine guard Luke Nelson was selected for this week’s honor. He averaged 17.0 points per game, and helped the Anteaters move into sole possession of first place with two victories last week. Most notable, he scored 28 in a victory over Long Beach State in a showdown for first place. Fotu averaged 21.5 points and 6.0 rebounds per game in two games last week. He also had a .586 field goal percentage (17 for 29) in the two games. Against Big West opponents this season, Fotu is averaging 19.3 points and 6.3 rebounds per game with a .654 field goal percentage. Elijah vows not to wash them off? Should be all good until mid-week, when his parents get a letter from the school regarding the fermented poi smell coming from Elijah’s arms. Great story, great effort, great win. Former UH Athlete, agreed, family played sports, long time ago for UH, we are alumnus, that special feeling connection with apprciative fans, nothing compares, especially in Hawaii, and when team Wins! You, know the deal, great event, team is on a mission, shore up the 3 pt shooting, really FUHA, the 3 pt shooters, should step in a few more feet for closer shots, when they hit the 17-19 footers, a couple, then step out to 3 line, they will start to knock down shots. That is the way, to get out of shooting slumps. Nevels, next level, even this year, has to learn to find screens and shoot behind that split second of window to basket, if they run good screens for him, and he learns how to use the screens to get that 3 look, Garrett will score more 3 pointers, without a doubt. I really don’t feel that Nevels will go into a 3 game shooting slump, watch, him get his floaters, assists, steals, layins, dunks, then start to knock down dagger 3’s, I believe, this team in home Cali for 7 of the athletes will be good, Sweep two? 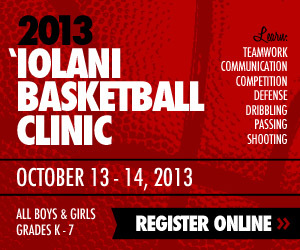 As Nevels says, : why not UH MBB team, ? they are as good as any BWC team, so Garrett and team, go get 2 wins, for UH Manoa!